StormCapture is an underground, modular, structural precast concrete storage system for storm water infiltration, retention, detention, and water quality treatment. Its modular design allows for site-specific configurations, including an option for subsurface infiltration. 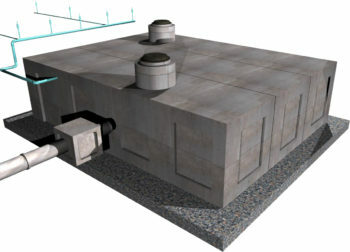 Whether your site needs a simple detention system to prevent storm drain overloading, a groundwater recharge system for Low-Impact Development (LID), a storm water treatment system to treat water quality, or a complete storm water harvesting system, StormCapture will provide your solutions. The system’s efficient design and open interior provides large storage capacity in a small footprint and can easily be used in deep applications and extreme loading conditions. StormCapture is rated for H-20 traffic loading with only 6-inches of cover and provides maximum design flexibility with interior heights ranging from low-profile systems up to 14-feet of clearance. Higher load requirements can also be accommodated. During construction, trucks deliver the modules on the day of installation, and cranes can immediately unload and set the units into place. Each unit is installed within a matter of minutes, eliminating the need to store modules on site and take up valuable construction site real estate. Light construction equipment can immediately be driven on top of the system, and native backfill can be used. The StormCapture design typically provides full access for physical inspection and maintenance. When StormCapture systems are combined with our pre- and post-treatment products, designers can further ensure downstream water quality is preserved. Reduces the consumption, usage, reliance and cost of potable water from municipalities. Contributes towards LEED credits for Sustainable Sites and Water Efficiency. This product is available nationally. Call (888) 965-3227 today to learn more.